Pencil pot is a high utility item to store the pencils of varied sizes in an order. It is widely used in library, kidâ€™s room, offices, and other places to keep the pencils and pens in an organized manner. Pencil pot is designed from plastic, wood, metal, and jute, an organic material. Jute pencil pot is a perfect blend of quality and function that provides a striking look to the ambience. Besides keeping pencils and pens, it is also used as a decorative item. 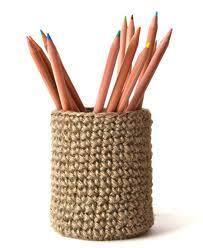 Pencil pot deigned from jute is highly demanding in the global market due to its high end features. 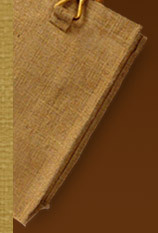 As jute is one of the strongest materials, therefore jute pencil pots are regarded as the highly strong and sturdy item. It does not get affected from any kind of harsh weather conditions. With its resistant to wear and tear property, it ensures long lasting excellent performance for a longer period of time. High efficacy and durability are the features that make jute pencil pot the best from pots of designed from other materials. Its beautiful raw, textural and organic look is hard to find anywhere else. Trendy and handcrafted jute pencil stand is 100% eco-friendly as designed from the natural fiber "Jute". Biodegradable nature of jute pencil pots makes them perfect for todayâ€™s environmental cautious era. It does not emit any kind of pollution while decompose after using. It adds ethnicity to the table, desk, etc. with amazing looks and quality. It is designed in varied attractive designs, patterns and dimensions. In addition to this natural and earthy tone, this item can be availed in varied attractive colors. With bleaching, treating and dying, it is transformed into varied other colors so that match with any kind of dÃ©cor. This cost effective jute pencil pot can be presented as a valuable gift or promotional item to employees.